Yesterday evening, members of the Senate Finance Committee gathered to consider a modified version of House Bill 1050 (HB 1050) which includes repealing the local privilege tax. A repeated claim by proponents of the tax repeal is that additional revenue from the local sales tax – resulting from the tax plan passed last year – will make up for the revenue lost from repealing the local privilege tax. A closer look at a fiscal note provided by the General Assembly’s Fiscal Research Division, however, highlights that the math simply doesn’t add up to support this claim. Fiscal Research estimates that a full repeal of the local privilege would result in nearly $63 million in less revenue for cities and counties across the state. Revenue from an expanded local sales tax is projected to bring in an about $10.9 million in additional annual local revenue and sales taxes from online sales via Amazon is expected to bring in around $2.9 million – for a total of $13.8 million in local revenue from an expanded sales tax. 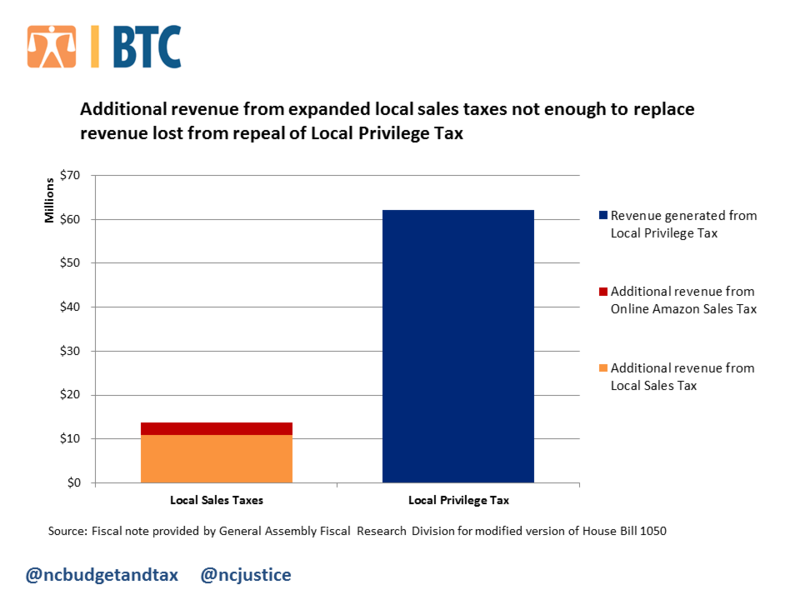 It is clear that $13.8 million in additional local sales tax revenue is not sufficient to replace $63 million in lost revenue from the repeal of the local privilege tax. Less revenue means local governments will likely be further challenged with providing its residents with core public services and an attractive quality of life. As usual the BTC math does not match with reality. The loss in this type of tax will be made up, assuming it is actually needed, at the local level by the commissioners who are thankfully very close to the voters. This is a much needed change where the individual voters can have a say on if they want an increased tax such as property tax or if they want the service. Definitely a step in the right direction. Yeah, it’ll be made up…. UP is DOWN, DOWN is UP in GOPLand.